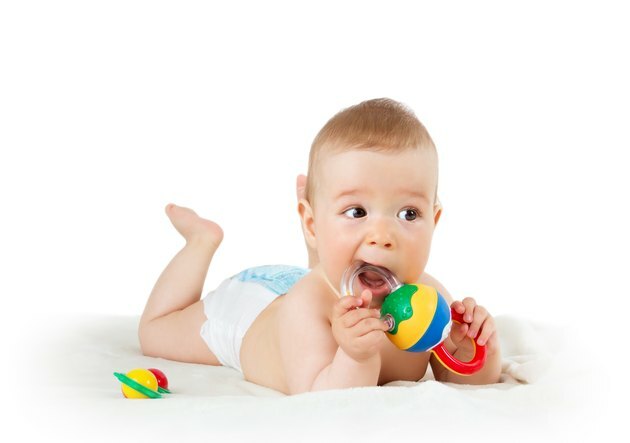 When baby starts teething, everything is fair game to chew on; her hands, your hands, toys, spoons, dog toys, anything to help relieve her aching gums. These pain management techniques are her attempt to help her first set of teeth break through her gums. This time in your baby's development may be quite uncomfortable and even painful for her. It may have you trying different over-the-counter remedies and homeopathic alternatives, such as vanilla, to help her achieve some relief. Expect to see the first sign of a white nub of a tooth erupting through your baby's lower front gum around the 6 month mark. It's not unusual to start teething a month or two earlier, or even a month or two later. Lower primary front teeth are normally the first to make an appearance followed shortly by the upper front teeth. After that the molars, upper and lower, followed by the canines and then the farthest back molars. Before the age of 3 years, your little tyke should be rollicking around with a full set of his first pearly whites. Three to five days prior to a tooth erupting through your baby's gum, he'll probably be fussy and possibly irritable. There'll be lots of drool and hand chewing and possibly a rash on his chin and cheeks from the drool. It's the pressure of the tooth on the gums trying to break through the skin that causes his discomfort. He may be cranky, unable to sleep and not want to eat. This is normal. Once the tooth peeks through, these symptoms should subside. What isn't normal, explains University of Florida Health, is diarrhea and fever. If your baby is experiencing either of these symptoms, seek medical attention. A home remedy sometimes used to help relieve baby's teething pain is vanilla extract. Although vanilla is widely used to help with teething pain, there is no scientific evidence to suggest its effectiveness, states a 2009 article in the medical journal Pediatrics in Review. However, according to the Handbook of Medicinal Herbs by James A. Duke, a few drops of vanilla rubbed on the tooth and gums can be used for toothaches. It can also have a calming effect. Rubbing a drop of vanilla extract over the area on the gum where the tooth is trying to get through may help ease the pain and have a soothing effect on your baby's anxiety. Vanilla is also known to help with upset tummies, so if your little one is distressed from swallowing too much drool, vanilla may help. There are other home remedies that may also help relieve your baby's painful gums. To alleviate sore gums try rubbing them with a wet washcloth that's been in the refrigerator or freezer for a few minutes. Let him chew on a cold apple or frozen teething ring. Any soft foods right from the refrigerator can also help lessen his pain, even a bottle of cold water might do the trick.